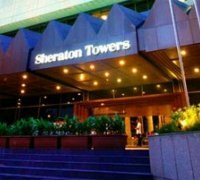 Located in the heart of the city along Scotts Road, the Sheraton Towers Singapore is famous for our warm and accommodating service. We are happy to help you in any way possible and look forward to making your stay enjoyable and memorable. We are just a short distance away from the Newton Circus he outdoor food court and the renowned Orchard Road shopping and entertainment district. Our 24-hour concierge desk and 24-hour front desk will help you explore the area and make reservations for you at local restaurants and make transport arrangements to take you anywhere you wish to go. Take a dip in our outdoor pool to cool off after a long day of shopping or exploration. Enjoy our choice of restaurants, serving everything from Italian to Cantonese to local and international cuisine. Our brand new Towers Executive lounge is now open, offering discerning guests a plush lounge experience with floor-to-ceiling glass windows for an unrivaled view. New daylight function venues are now available. Fitted with modern facilities, the three function rooms, plus a Boardroom, are perfect venues for meetings, seminars or private dining. For the ultimate in residential bliss and the epitome of service excellence, stay at the Sheraton Towers Singapore.